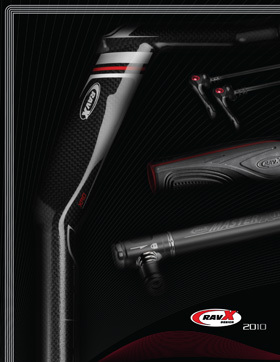 RavX makes quality cycling accessories and components that rival the world’s best. I’ve put in a lot of time creating high-end designs for them since early 2007. This particular catalog is one of longest and most complicated projects I have worked on. Not only was I in charge of conceptualizing the design, but I also had to orchestrate all the photo shoots and prepare the entire design. The book features 80 pages + cover and holds a number of design details that I’m quite proud of. First of all, I designed 10 different signature background spreads to be switched out throughout the book. This is intended to keep the reader interested and avoid a feeling of monotony. 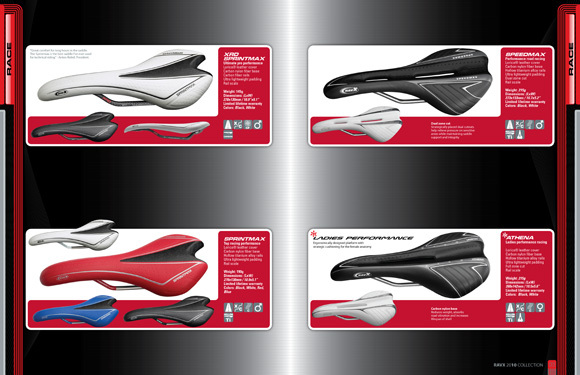 I also created an additional 3 spread designs for the high-end product section that stand out from the rest of the catalog. 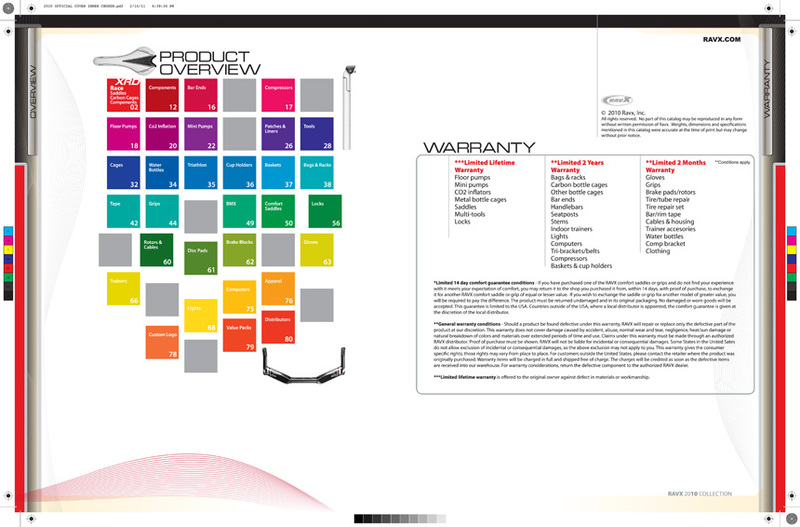 Sample of inner cover spread layout with printer registration and color marks. 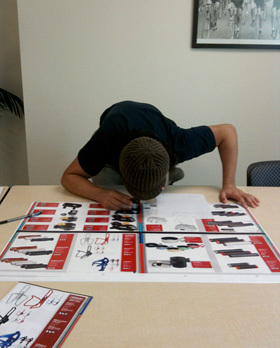 Reviewing final pre-press proofs before production. When I design books, I have to take into account the size and girth of the project and choose materials and production techniques accordingly. This catalog is intended to be shipped around the world, so I also have to choose materials that keep the book structurally sound but do not make it unnecessarily heavy. 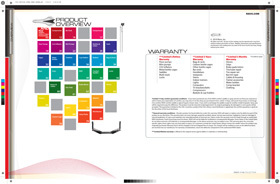 Other standout features are the color coded sections, perfect-bound build, metallic Pantone 877 5th color and spot UV coating on the outer and inner covers. 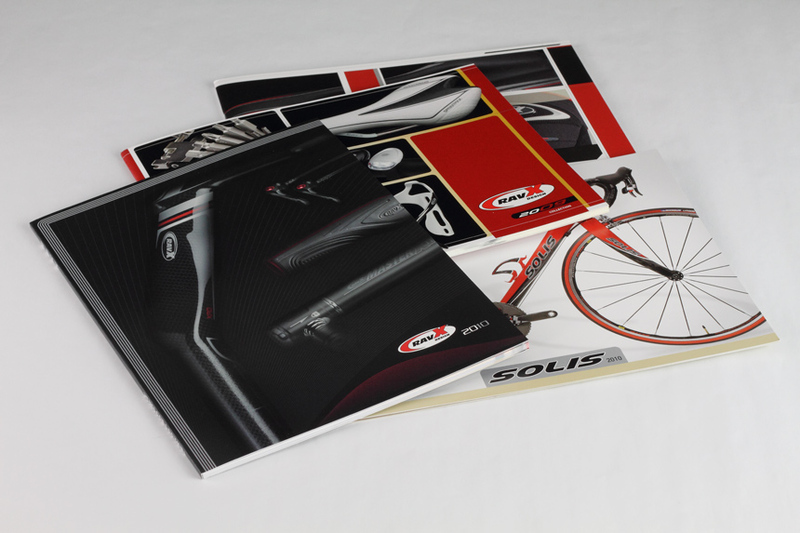 This catalog does a perfect job of portraying the high-quality image of the product it showcases! Based on etiquette, I can’t reveal the final production numbers but let’s just say enough were printed. This is number 4 of the 5 RavX, Inc. catalogs I’ve designed thus far. See below for the “race section” page spread which features some of the high end performance saddles. Further below there’s a photo of the book alongside others I designed. Click to zoom. If you look closely you can see the spot UV coating over the product photos on the cover.